PORTISHEAD snooker players have won both opening legs of the Cuestars Championship Tour. 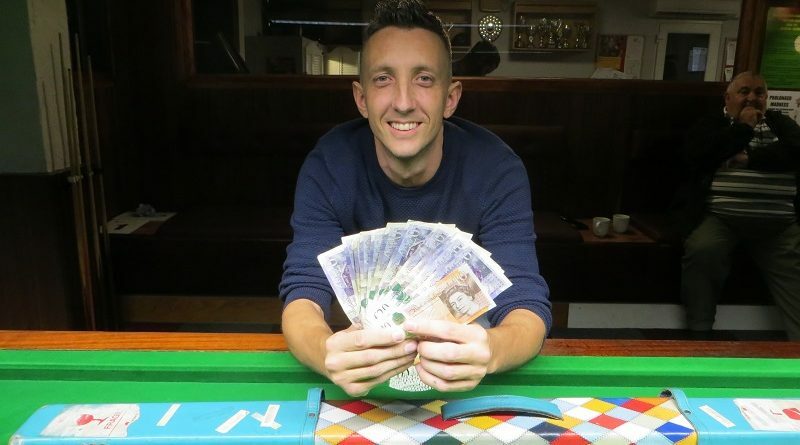 Mark Vincent took a major detour on his way home from a Challenge Tour event in Barnsley to collect £250 prize money at Chandlers Ford Snooker Club, near Southampton. The 34-year-old wrapped up a 2-0 victory over Southampton’s Christian Chislett in a 19-minute final with a break of 78. In the last-four, he overcame Jamie Wilson, a 14-year-old from Havant, 2-1, a reversal of the scoreline when the pair met in the round-robin group stages. Vincent replaces his practice partner, Ben Hancorn, who won the first leg in Swindon, at the top of the rankings. Reflecting on his busy weekend, he said: “I travelled down last night and so I thought I’d stop in on my way back and have a go. “I fancied myself. I was playing well. “The first match I’ve lost 2-1 but I qualified out of my group. I had a tough semi-final match. In the final, I played well enough and upped it a few gears when I needed to. Vincent, a composite operator at GKN Aerospace, Avonmouth, took up the game seriously at the age of 19. A semi-finalist on his Cuestars debut in Swindon, he also competes on World Snooker’s Challenge Tour, the feeder for the professional circuit. The 46-strong field, the second biggest in the competition’s history, returned 31 breaks of 50 or more in the event sponsored by Ahmad Tea. Chislett recorded the highest of 106 in his final group-stage match against Adam Nash, his teammate for Churchills A who compete in the Super League of the Southampton & District Social Clubs League. Former English Under-18 Champion Mark Lloyd, who recently complied his third maximum 147 break in a practice match, fired in a 102 against home player Stu Barter. Top Spot Snooker Club, Havant, hosts the third leg of eight on Sunday, November 18. Ahmad Tea is an international tea producer whose global headquarters and specialised high value products factory is a stone’s throw from Chandlers Ford Snooker Club. For more information, go to www.ahmadtea.com. Christian Chislett: 106, 68, 54. Mark Lloyd: 102, 62, 53. Neil Craycraft: 79, 66, 50. Mark Vincent: 78, 78, 52. Connor Benzey: 78, 67, 51. GROUP A: 1st, Mickey Joyce (Academy, Basingstoke); 2nd, Riccardo Drayton (Chandlers Ford SC); 3rd, James Height (Break N Dish, Street, Somerset); 4th, Steve Wheatland (Chandlers Ford SC). GROUP B: 1st, Connor Benzey (Chandlers Ford SC); 2nd, Mark Lloyd (Stoke SC, Gosport); 3rd, Stu Barter (Chandlers Ford SC); 4th, Pat Patel (Crucible, Newbury). GROUP C: 1st, Jamie Wilson (Waterlooville Sports Bar); 2nd, Mark Vincent (SWSA, Gloucester); 3rd, Labeeb Ahmed (Frames, Coulsdon); 4th, Ryan Hughes (Chandlers Ford SC); 5th, O’Shay Scott (Chandlers Ford SC). GROUP D: 1st, Martin Wallace (Crucible, Newbury); 2nd, Arron Smith (Selsey RBL); 3rd, Ross Barker (Abingdon Cons); 4th, Craig Marsh (Crucible, Newbury); 5th, Mark Ridout (Greenbaize, Bournemouth). GROUP E: 1st, Pascal Richard (Mayfair, Gosport); 2nd, Oliver Sykes (Chandlers Ford SC); 3rd, James Budd (Stoke SC, Gosport); 4th, Andrew Darken (Chertsey SSRN Club); 5th, Callum White (Waterlooville Sports Bar). GROUP F: 1st, Ryan Mears (Sovereign, Farnborough); 2nd, Ronnie Blake (Frames, Coulsdon); 3rd, Dan Sykes (Chandlers Ford SC); 4th, Ian Desmier (Break N Dish, Street, Somerset). GROUP G: 1st, Henry Eastwood (Frames, Coulsdon); 2nd, Karl Walker (Crucible, Newbury); 3rd, Paul Ganley (West Byfleet Social Club); 4th, Elliott Weston (Top Spot, Havant). GROUP H: 1st, Christian Chislett (Churchills, Eastleigh); 2nd, Steven Nevett (St James Institute, Bournemouth); 3rd, Adam Nash (Churchills, Eastleigh); 4th, James Trump (SWSA, Gloucester); 5th, James Cullen (Woking SC). GROUP I: 1st, Paul Bunyard (Sunninghill Comrades Club); 2nd, Neil Craycraft (Jesters, Swindon); 3rd, Matt Stadius (Selsey RBL); 4th, George Heatley (Woking SC); 5th, Chloe White (Waterlooville Sports Bar). GROUP J: 1st, Bradley Cowdroy (Greenbaize, Bournemouth); 2nd, Steven Hughes (Chandlers Ford SC); 3rd, Darren Johnson (Petersfield Bowling & SC); 4th, Neil Herd (Salisbury SC); 5th, Anthony Foxcroft (Salisbury SC). LAST-16 (10 points): Vincent 2-1 Joyce, Lloyd 2-0 Richard, Wilson 2-1 Wallace, O Sykes 2-1 Benzey, Craycraft 2-1 Mears, Nevett 2-0 Eastwood, Chislett 2-1 Cowdroy, Bunyard 2-0 S Hughes. QUARTER-FINALS (12 points): Vincent 2-0 Lloyd, Wilson 2-0 O Sykes, Craycraft 2-0 Nevett, Chislett 2-0 Bunyard. SEMI-FINALS (£55, 15 points): Vincent 2-1 Wilson, Chislett 2-0 Craycraft. FINAL (£250/£100, 25/18 points): Vincent 2-0 Chislett.